This recipe makes 2 1lb loves (or if you just want to use your machine, one 2lb loaf). 2 tsp yeast, warmed to room temp. I use Fleishman’s bread machine yeast that’s in the refrigerated section. Warm you yeast to room temperature. Place all the ingredients into the machine in the order suggested by your bread machine’s manufacturer. Use the dough setting. When the machine is finished, punch down the dough and divide it into equal portions. I use my kitchen scale to weigh them out. Grease your loaf pans. I use olive oil rubbed around with a paper towel to keep this soy free, but you can use spray oil. Using a rolling pin and a floured surface, roll each ball into a rectangle no wider than your loaf pan. Rolling out the dough squeezes out all the air bubbles that can create holes in your loaf. Roll the dough up jelly roll style starting with the short side and place seam side down in your greased pan. Repeat for 2nd loaf. You want to let your bread rise in a warm place until it’s the size you want it to be (I usually go to just above the edge of the pan.) Since we keep our house cooler in the winter and spring I end up warming my oven slightly (to about 80*) and putting my towel covered loaf pans in to warm. It takes about 1 1/2 – 2 hours to rise completely. I check my ovens temp every half hour or so just to make sure it’s still warm. When the rise is complete, remove loaves from oven, if using it, and preheat to 375*F. Bake for 30 mins and let cool in pans on wire racks. Remove from the pans by sliding a knife around the edges and cool completely before storing. Loaves freeze well. I end up making 2 loaves and freezing 1. I just use a gallon size freezer bag. It comes out just as fresh as when it was made. I store all bread in the refrigerator in a gallon freezer bag and cut slices as needed. Rhubarb is in season and it’s plentiful. Last year I first heard of a rhubarb cream pie. It’s something my Darling Hubby had when he was growing up. My family only ever made sweetened rhubarb boiled down and eaten straight out of a bowl. This pie is really yummy and is one of my new favorites for the spring. You can use your favorite double crust recipe, but this is my favorite go to pie crust. It’s flavorful and flaky (and in my case, can be made soy free!) The original recipe is written to make 2 double crust pies, but I’ve halved it for you in brackets, so if you want to make one double crust pie, please use the number in (). Mix flour, baking soda and salt together and cut in butter or shortening til you have course chunks. Set aside. In a liquid measuring cup mix vinegar and the beaten egg and add enough cold water to equal 1 cup (1/2 cup). Pour liquid into dry and mix til dough forms. Roll on a floured surface and line the pie pan bottom. Prick with a fork all over and add filling. Mix sugar, flour, nutmeg, eggs and rhubarb in a large bowl. Pour into prepared pie crust. Top with remaining crust (lattice if you so desire), or cut slits for venting and bake 50-60 mins at 400* F.
Bug’s birthday party was scheduled for February 4th and if I wanted to share in the festivities and eat cake, I had to find one that was ok for me to eat. All the boxed mixes contain soy. Bug loves strawberries and asked for a strawberry cake (chocolate was easy, but not strawberry) and that left me to find a homemade strawberry cake…there are some out there, but they all use strawberry gelatin and not having a box in front of me I didn’t know if there would be soy or natural flavors included…plus I didn’t want the added food coloring, especially since I was already planning on dying the frosting red, green, blue and yellow. Then I stumbled upon this little gem or a recipe. Rather than strawberry gelatin it used real strawberry puree! Score! Here’s the recipe copied from the above link. Thaw (if necessary) strawberries and puree. Bring butter, eggs, and milk to room temperature. Combine sifted flour and baking powder in a bowl and set aside. 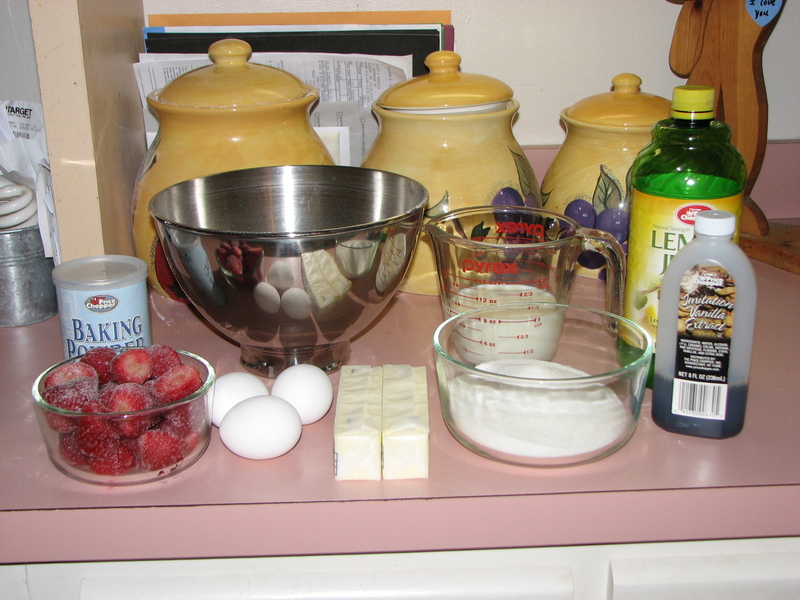 Using a mixer, cream the butter and sugar. Add eggs 1 at a time; mix well after each addition. Next add pureed strawberries and extract and combine well. Gradually add the flour (and baking powder) and the milk alternating between them until completely mixed. Then add lemon zest and juice and mix well. The cake just out of the oven. 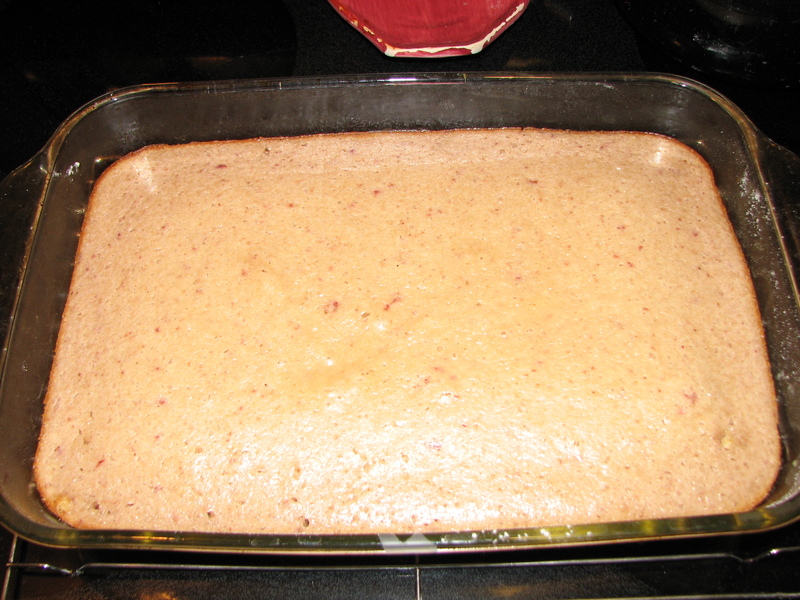 It smelled delish, really just like a boxed strawberry cake, only better! 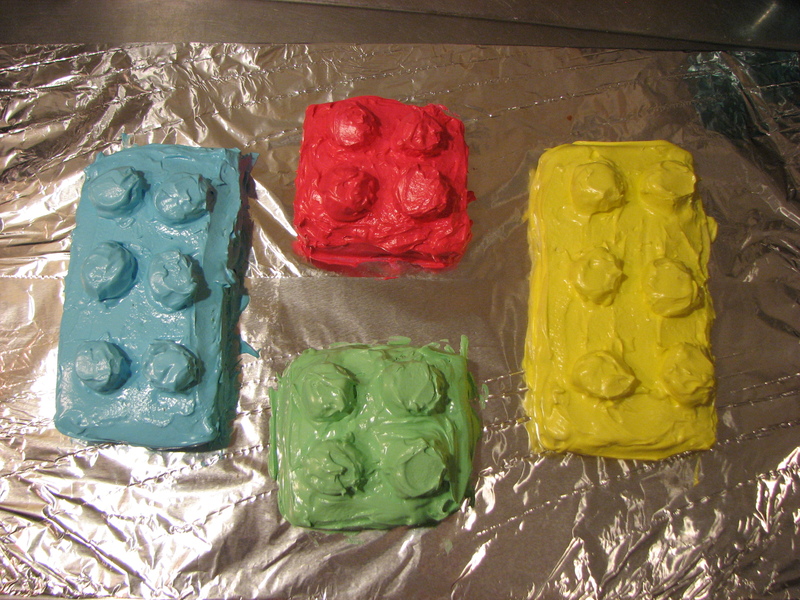 So the verdict…Darling Hubby asked me to make it again, leaving the frosting off. My complaint was that it didn’t bake up fluffy like a traditional cake, though that might have been because I used AP flour rather than cake flour. It was dense, more like a fudge brownie than cake. It had good flavor, though. Most of the kids ate it, but by the time we had cake they’d filled up on fruits and veggies. lol Despite the cake being soy free, it appears that butter is going to be another issue, but we knew that was a possibility. Hopefully when my gut heals from all the soy damage I’ll be able to introduce milk and butter again (cheese seems to be ok for now). Oh, and if you want to see the finished decorated cake, here ya go. 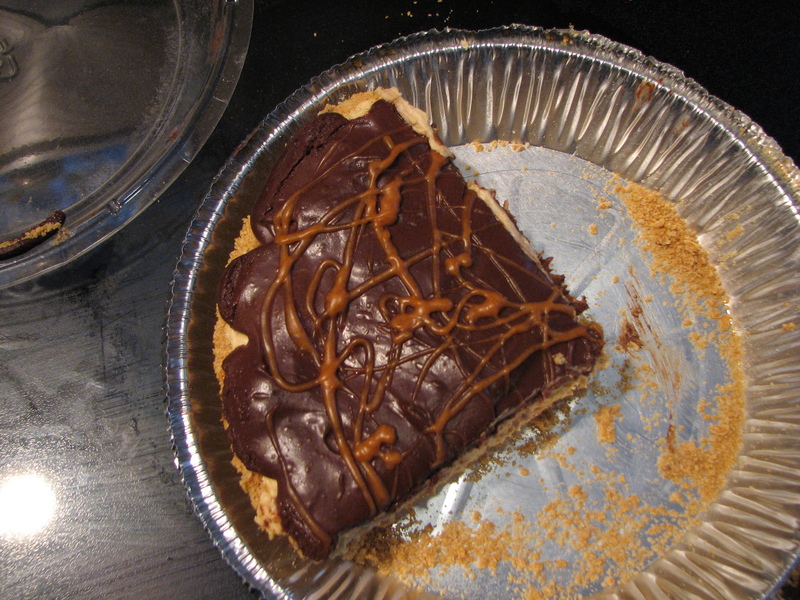 My husband loves Reeses Peanut Butter cups and this pie comes close to recreating that in a pudding pie. It’s so delicious and easy to throw together. 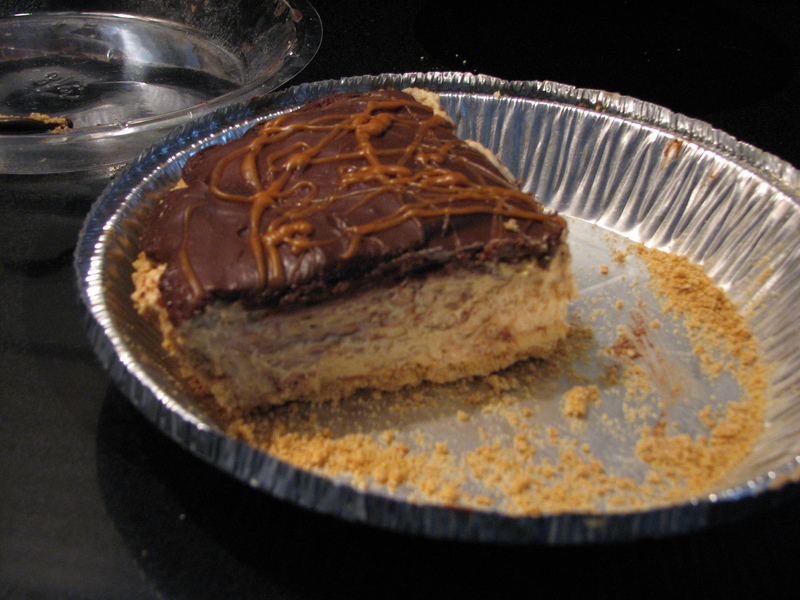 I’m not sure of where I found the original recipe for this (it’s possible it was on a cream cheese or cool whip package.) I apologize in advance for the less than stellar photographs of a quarter of a pie…it’s seriously so good that it disappears so fast! Mix the cream cheese and 1/2 cup peanut butter together until smooth. Add the pudding mix and the cold milk and blend until well mixed. Whisk in 1 cup of the cool whip. Pour filling mix into the crust and refrigerate until ready to use. When the chocolate mixture is cool, spread over the pudding mixture in the pie crust. In a small microwaveable container, warm the last Tbsp of peanut butter for approximately 30 seconds and drizzle over the chocolate topping. Recommended chill time is 4 hours…it usually doesn’t sit that long in our house! Enjoy! When someone mentions comfort food, I usually think of Thanksgiving dinner, and with Thanksgiving in 2 weeks I’m already drooling for the roast turkey (check out Alton Brown’s Roast Turkey – it’s the best, ever! ), mashed potatoes with gravy, sweet potatoes with toasted mini marshmallows (or baked since Darling Hubby doesn’t care for the marshmallows), green beans and who could forget cranberry sauce. Mmm…makes my tummy rumble just thinking about it…But, in today’s busy world, who has time to cook a turkey with all the fixin’s for dinner during the work week when you are craving that comfort food? Well, aside from me, being a stay at home mom, not many people do. I don’t know if this recipe exists in the world already, but it’s something that I made up based on another meatloaf recipe. I like to call it Thanksgiving Dinner Meatloaf. It’s nice served with mashed potatoes (or sweet potatoes and marshmallows if you desire) and veggies to round out your weeknight meal. Mix the turkey, dried stuffing mix, water, 1/4 cup of the cranberry sauce, dried cranberries and the eggs together until well combined. I do this in a bowl with my hands, but you can also put everything in a large zip top bag and mix it that way. Shape into a loaf and place on a rack on a sheet pan (or on another pan that will allow for drainage of any grease). Top with remaining cranberry sauce. Bake for 1 – 1.5 hours at 375*F until internal temperature reaches 165*F.
Slice and serve with your desired fixin’s and enjoy!